At the recently-held USTA semi-annual meeting in NYC, a significant call item was passed unanimously that states: Beginning Jan. 1, 2012, all USTA-sanctioned tournaments for 10-and-under players will be mandated to use the QuickStart/10-and-under format, which is in compliance with the ITF's new rule change for 10-and-under competition around the world. But what does the new 10-and-under rule change mandated by USTA national and the International Tennis Federation (ITF) mean for Florida? Starting in January 2011, only USTA Florida-sanctioned "Rookie 10-and-under" divisions will be mandated to use the QuickStart Tennis format of play on 60-foot courts, and to be inclusive of all six components of the QuickStart Tennis format of play (proper-size racquets, nets, balls, etc.). USTA Florida and the Junior Competitive Council will decide how to proceed with the 10-and-under mandate for 2012 tournaments in the near future. "USTA Florida has decided to phase in the QuickStart Tennis format in our tournament structure, beginning with the Rookie tournaments in 2011 and possibly other level tournaments in 2012," said USTA Florida Associate Executive Director, Play Tennis Division, Andy McFarland. "The new USTA ruling also allows USTA Sections a provision to use a green ball, which is 25% less compressed than a yellow ball, for some 10-and-under tournaments on a full-size court, which could also be part of our tournament structure in the future." USTA Florida-sanctioned Local, Super Series, Designated, and Sectional-level tournaments for the 10-and-under divisions will keep the full court for the 10-and-under divisions in 2011. USTA Florida will be offering Rookie Tournament Director Workshops this fall to prepare for the new mandate. 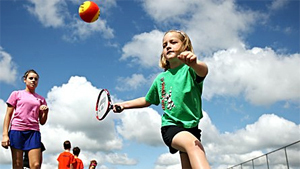 The 2011 specifications for Rookie 10-and-under divisions hold that all tournaments for those ages 9-10 be played on 60-foot courts using orange low-bounce tennis balls and regulation nets (3 feet at the center). "There are approximately 10,000 tennis players nationwide under the age of 10 that play competitive tennis," McFarland said. "That's not even a drop in the bucket of participation compared to other sports in the same age demographic. The new 10-and-under tournament requirement to use the QuickStart Tennis format of play is going to significantly foster and grow tennis nationwide. If what we have now isn't truly working, why shouldn't we (USTA) try something different to catch up to the other sports that are beating us to the punch with kids 7-10 years old?" The change in tournament format by both the USTA and the ITF was reached after weighing the benefits for beginners as well as recurring and high-performing youth players. Studies have found that competition, when conducted in a welcoming environment that allows for multiple play opportunities, enhances kids' enjoyment of the game. And for aspiring collegiate and professional players, the QuickStart Tennis play format fosters proper technique and enhances strategy, key components to success in competitive play. USTA Chief Executive, Community Tennis Kurt Kamperman notes that the U.S. lags behind countries such as Australia, the U.K. and France that all have significantly more junior competitive and 10-and-under children playing tennis than the U.S. in regards to percentage of population. "We've had shorter racquets and slower balls for close to 20 years, but we were late to the game in providing the appropriate competitive environment for young kids," Kamperman said. "Previously, we were just using the modified equipment as training tools. Finally, we realized that if we could control the training environment, why couldn't we control that competitive environment too? Once we saw that other countries were playing their 10-and-Under championships with these slower balls and on smaller courts, that was the big 'aha' moment."